Is there a hard cap on Crit? The other day some guildies were going on about Crit being hardcapped at 64%. After much looking around the on,y hard cap I know of is 33.5k resistance and bunch of Cyrodil damages and heals that might not be relevant anymore. IDK? There is no Hard Cap for Crit chance, crit damage or crit resistance. Well if your crit chance is 100% then no need to get higher, and there are very few sources of crit damage so no need, and same with crit resistance. My main is at 69% crit chance so, definitely not hard capped at 64%. I heard rumors theres a "hidden" hardcap at 90%. The ppl who told me said u can get above 100%, but your actual chance wont be above 90%. No hard data - sry. I would say that the effective cap is around 60% to 70%. Reason, that gains above that are not going to net you all that many more Crits in a fight, and you maybe better off boosting other resources/stats instead. But, really, the Cap is 100% from what I have figured out. My stamsorc has 80% crit with thief mundus. I swapped to shadow mundus, bringing my crit down to about 65%. Following your statement, my dps should have seen a surge due to my crits hitting harder due to the shadow mundus, right? This was not the case. My dps stayed almost exactly the same, if not a tiny bit lower. Resistance is capped at 33.5k or something close to that. I can get my resistance to over 40k, but does no good as 33.5k is the cap. See what I mean. I've no idea where they pulled this magical number of 64% but they were going on about 2 out of 3 hits will most likely Crit with that much. I've no argument for or against it. Was mostly looking for something like they added it in patch notes a few years ago and no one noticed. Or maybe some math wiz posted his findings and this seems to hold true. Also, I'm on console so there's no real metrics to follow. 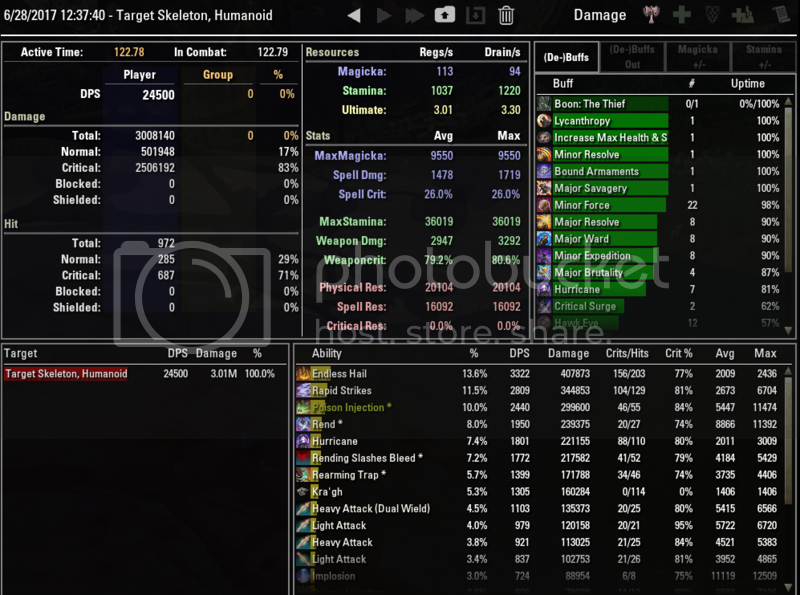 I would guess if a pc DPS test showed the total number of abilities used and how much actually did Crit the 64% could end up being more like 95% of the time you Crit. I have around 82% Crit on khajit nightblade. I'm thinking if there's any truth to the 60% range maybe it be better to switch to shadow or warrior mundus? My above statement was based on the readings from combat metrics on PC. 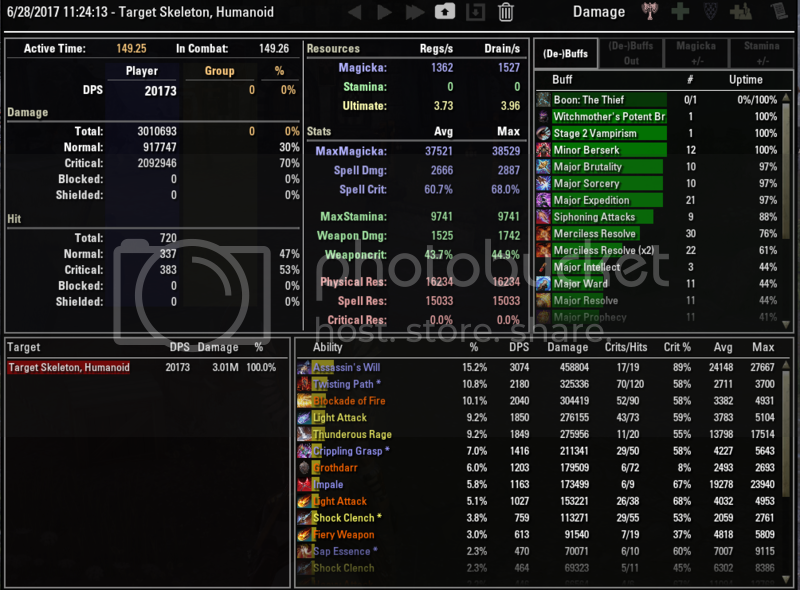 My dps saw no change (even a slight dps drop) when swapping from thief to shadow mundus (80% crit - 65% crit), where it should have seen an upwards surge if the cap was at 64%. Your guildmates were probably making guesstimates based on what they thought was logical. In fact, you can even see this 64% crit cap to be a myth in the screenshots I uploaded in another thread that I made. A max of 68% crit chance with an average of 60% (I didn't double bar Inner Light) caused my magblade to crit 53% of the time. An average of about 80% crit chance made my stamsorc crit 71% of the time. While they do not exactly match up to their listed values, a higher crit chance than 64% will still increase your crit rate, as shown. It seems that the amount of times you actually critically hit is about 10% lower than the listed value in the character sheet, however. Although these could just be outlier cases. 80% crit chance with 50% base crit dmg is a critical modifier of 40%. 63,225% crit chance with now 68,3% crit dmg is a critical modifier of 43,18%. Your dps shall be a tiny bit higher. Well, you guys have much experience and better tools than me. It's tough work trying to re-invent the wheel. I can't make heads or tails out of the math expressed. What in the world is this critical modifier now? A coefficient that determines how much damage your attacks are modified by, based on your crit chance and crit damage. I'm not 100% sure if it's as straight forward as @eso_nya put it, but that's basically what it is. Tbf its a theoretical value, but gives u a good average on what u should expect to see when changing stats. That's because you have 114 hits from Kragh's, which can't crit. Account for that and your actual crit was 82%. Same for Grothdar on the other parse, puts you at an actual 63%. That's because you have 114 hits from Kragh's, which can't crit. Account for that and your actual crit was 82%. Same for Grothdar on the other parse. The closer, the better. Thats why theres no "thief always better than shadow". 59 in elfborn is 20%? I assumed when i read it that he was talking about Crit% Damage, but other people seem to have taken the view that it was Crit% Chance. Now my understanding is that Crit% Damage is harder to increase than Crit% Chance, the base amount is 50%, and it can be increased to 62% by taking the Shadow mundus and 68.3% if you take divines on all seven traits. You can also boost your Spell Critical Damage by another 25% if you put all 100 CP's into Elfborn. So as I understand it, in theory, you could boost your Physical Crit% Damage to 68.3%, and your Spell Crit% Damage to 93.3%. But look at the build resources you would have to commit to achieve that, and remember this is a percentile increase NOT a flat rate increase, so its value is directly affected by your basic damage, and your percentile chance to crit. e.g. If you don't crit its wasted, and if you do crit but you hit like a wet noodle then it just hits like two wet noodles instead of one. As @eso_nya says above the accepted guidance I've read is that Crit% Chance and Crit% Damage should be balanced. So, if you just have the basic +50% Critical Damage, limit your Crit% Chance to 50% also. It's not worth investing more. But if you really were going for the +93.3% Critical Spell Damage, then you really need to push your Crit% Chance up to a similar level to make it worth the investment. I'm on console. When my buddies were talking about the 64%Crit, they're talking about the Crit chance you see on character sheet. No add ons or metrics to give a clearer picture. Critical damage is hidden someplace never to be seen, we can only trust when we do have a critical hit that it is applied correctly. 100%, can't be reached on a magicka build as far as I know but stam can get very close with Khajiit racials. You dont even need to be a Khajitt. My imperial Nighblade can get there with leviathen, VO, and precise daggers. Now its certainly not optimal, but you can get there. I think I had her at like 102% crit. In PVE, magic builds will be around 60% ( a sorc in BIS gear running Necro has a crit chance of 58.7). Stamina builds are usually about 10 pts higher. It might have been better to increase base damage in this case, rather than increase the crit damage. My statement was that with diminishing returns, there comes a point where putting resources into other areas may have benefit to your character. In fact, since you saw overall the same amount of DPS, it kind of proves the point I was making. You have two paths to get to the same output, so pick one. Then your original post was wrongly worded, as you made a case for an "effective cap" which is wildly different from "a different path to get the same output". A cap means that any stats spent above that cap is effectively wasted. As such, if there was an effective cap of 60-70% crit chance as you said in your initial post, I should have seen a dps output increase when spending any stats above that crit cap into a different resource, not the same (or lower) output. With VO TBS & 2H my Crit is %71. It does go to %82 with DW but that's broken ATM. Shadow gives me %17 extra Crit damage. I put %20 extra in precise strikes CP and get another %10 from trap beast. So with standard Crit of %50 plus all the extras that would be %97 extra damage when Crit right? At %71 of the time? That %97 could go up another %15 from warhorn to %112. That would give me a theoretical modifier of %68 I think? I have a headache now. So originally I was asking if there is a hard cap on Crit and apparently the answer is no. But you can have lower Crit and higher Crit damage or higher Crit and lower Crit damage and still achieve same or similar results. I think this why TBS used to be so popular. Cause with a different set I have to choose one or the other mundus. K so then the modifier number I'm curious about. it seems would only be a part of the equation to compare different mundus on same gear setup and would be completely different on different gear and even a much lower number could still mean higher damage. Regarding the separate crit damage modifiers, I'm unsure if they stack multiplicatively or additively. CP has had some wonky issues regarding modifiers, so I wouldn't be surprised if it's multiplicative instead of additive. When they nerffed warhorn from %25 to %15 some time back I recall the notes saying it is added now instead of multiple so made it mostly the same really in the end. Not sure of the others. Yeah i remember something in the lines of "Major Force now stacks additive, to make it behave like the rest of the crit dmg boosts" aswell.